Want to Teach English in Cambodia? Cambodia has become one of the must-visit destinations in Southeast Asia. Pristine beaches, ancient temples and exotic jungle, are just some of the compelling attractions of the country. Program participants are assisted to find paid teaching positions throughout the country, and demand for English teachers remains consistently strong. This TEFL/TESOL Certification Program combines the essentials of what you need to become an effective English teacher, find suitable employment, and begin a successful career in your new country. Our intensive four-week course in Phnom Penh gives you the skills and methodology needed to feel comfortable and competent teaching EFL (English as a Foreign Language). The training includes 100 hours of in-class training and 20 hours of actual teaching practice with local students. Your classes will be observed by our professional training staff, and you will be provided with constructive feedback to improve your teaching style. In addition to classroom instruction in effective EFL teaching principles and techniques, you will learn the creative approach to lesson planning, how to conduct effective classroom activities, and strategies to implement your training with local EFL students. Unique through our program in Cambodia is our guaranteed job placement for graduates that want to stay and teach in Cambodia. Our local team can also offer excellent guidance to people who want to teach in other parts of Asia after completion of the TESOL Certification Program. Just like with any other LanguageCorps program, our lifelong job search assistance is not limited to any specific country. We can help you find a job as an English teacher anywhere in the world! The TESOL Certification Program Fee in Phnom Penh, Cambodia is US$1,525. Airport pick-up is included in this price. Hotel accommodations during your 4-week program can be arranged in the heart of Phnom Penh for an additional fee of $600. A daily continental breakfast is included in this price. All rooms have air-conditioning and western style bathrooms with hot water. Accommodations begin the Saturday before your program start date, and conclude the morning after the final class. Additional days can be arranged before/after your course for an extra fee. An average workweek is usually 30-35 hours, including class time and preparation. Schools usually open at 8:30am and generally close at 3:00pm. A typical teaching day consists of two or three lessons, while the remaining work hours are dedicated to lesson planning and grading. There is a wide array of jobs available in Cambodia. Our graduates find employment at public and private schools, and at the university. For this reason, your students can vary between children, teens, young adults and business professionals, or a combination of these. 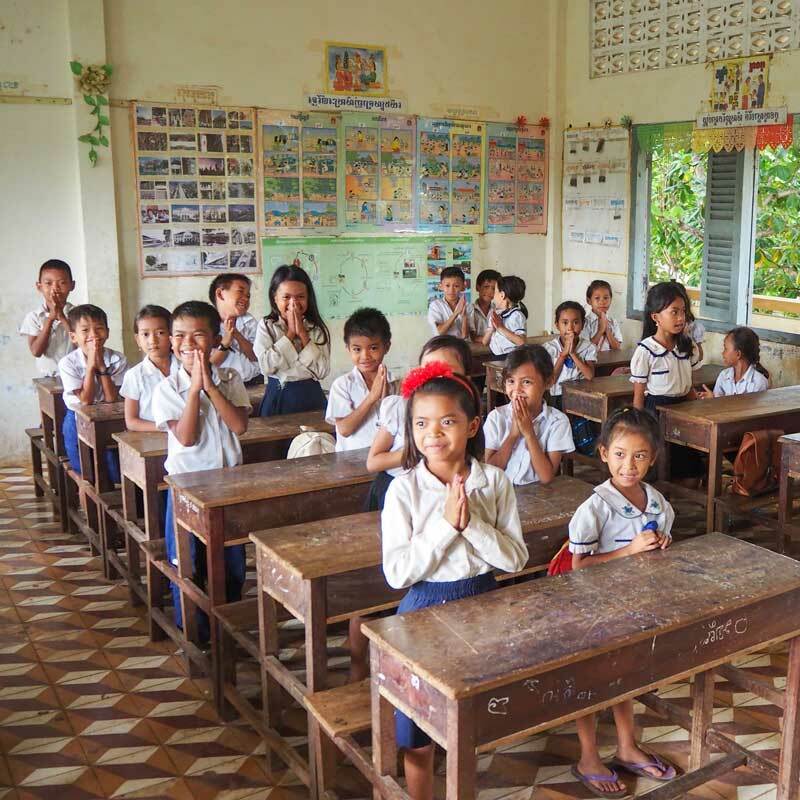 The demand for English teachers in Cambodia continues to grow and hiring happens year round. Contracts are usually between 6-12 months. If the length of your contract is on the higher end, your salary might be a bit higher, too, as schools prefer to create continuity for their students and are often willing to pay for it. LanguageCorps Teachers usually find jobs in our primary focus area, in and around Phnom Penh, Cambodia. A few choose to go outside this area, and with our assistance, have been successful finding multiple opportunities in Sihanoukville, Battambang and other cities in Cambodia. If you choose to go outside the primary focus area, the process may take longer, and may require additional out of pocket expenses on your part. To start your job search in Cambodia, you need to be in the country as 99% of interviews take place in-person. A TEFL, TESOL or CELTA certificate is needed for teaching ESL in Cambodia and makes you very marketable as a teacher. A 4-year degree is preferred, but certainly not required. Out of all Asian locations, Cambodia is the ‘friendliest’ for teachers without a college degree. This also makes Cambodia an interesting teaching destination for teachers without a degree who eventually want to teach in countries where the requirements tend to be higher, like Thailand and Vietnam. Gaining teaching experience in Cambodia to increase your chances of finding a paid position in other Asian countries is definitely a smart idea! Typical wages for LanguageCorps teachers range from US$700-$1,100/month. Local living expenses are very low: about US$500/month. You should be able to find a nice private apartment for about US$200-US$250 and you can get the most delicious street food ‘for a song’. If you want to go upscale for dinner, you will come a long way with only US$10. As a LanguageCorps teacher, you can earn enough to live very comfortably, enjoy local entertainment and restaurants, and travel to local attractions. Benefits vary depending upon the school, and may include full or partial reimbursement of airfare, free housing, medical insurance and/or an end of year bonus. Housing is sometimes provided by the hiring school, though generally teachers prefer to find their own housing. School accommodations are typically Cambodian, and rarely meet the standards Westerners are used to. In addition to the program and housing fees, you will want to plan for airfare, any visa costs, and personal expenses (meals, local transportation, security deposit and first month’s rent on an apartment once you know where you’re working). Everyone needs a visa to enter Cambodia, with the exception of those who hold passports from Indonesia, Loas, Malaysia, the Philippines, Singapore, Thailand, and Vietnam. All other nationalities must obtain an e-visa prior to departure, online. This visa allows you to stay in the country for 30 days and would suffice for the duration of the course. 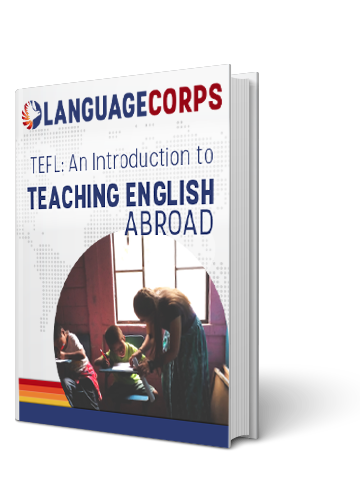 It is not very common for LanguageCorps teachers to teach on a tourist visa. The main reason for this is that you will have to leave the country every 30 days. The easiest option to teach in the country legally is to get a business visa (called an Ordinary Visa) instead of a tourist visa. Business visas can be extended without having to leave and re-enter Cambodia. If you obtain your visa upon arrival – you should convert your tourist visa into a business visa- you will need about $35 US cash along with one visa size photo. Your passport must be valid for at least six months beyond your date of entry into Cambodia. With its history of war now an increasingly distant memory, Cambodia has become one of the must-visit destinations in Southeast Asia. Pristine beaches, ancient temples and exotic jungles, are just some of the compelling attractions of the country. As the capitol, Phnom Penh is the political and commercial center of the country, and the city is home to over one million people. Once considered the most beautiful of all cities in French Indo-China, much of the city’s colonial charm has survived the violent decades the country and its people have experienced since independence. Beautiful (if somewhat dilapidated) public buildings and private villas are a lovely part of the legacy left by the country’s French rulers. Phnom Penh also offers travelers the Royal Palace, the Silver Pagoda and the excellent National Museum, plus a wide selection of hotels, restaurants, cafes and bars. While many areas of the city are booming, with a beautiful riverfront and lively nightlife, it is hard to escape the poverty and the fact that many Cambodians are still struggling to survive. However, the economy in Cambodia is beginning to flourish, and its residents have a strong need and desire to learn English. Phnom Penh offers the discerning diner plenty of choices at a range of prices to suit any pocket. We recommend that you acquire a taste for the local cuisine, which is varied and can be very inexpensive. Be prepared for rice and seafood, especially shrimp, crab, and freshwater fish dishes. Cambodian cuisine is related to both Thai and southern Chinese cuisines. Ubiquitous soups include somlar machou banle (sour fish soup), somlar chapek (pork soup with ginger) and num banh choc (a noodle and fish soup often served for breakfast). Rice is often served with sach mon chha khnhei (stir-fried chicken and ginger), choeeng chomni chrouc chean (pork spare ribs), or the spicy an sam chruk (pork and soybeans marinated with ginger and chiles). In Phnom Penh, the large number of Chinese immigrants mean excellent Cantonese, Hokkien, Teochou and Hailam restaurants abound. Thai, Vietnamese, and French outlets are also available. Fresh vegetables and fruits – especially coconut, durian, mango, pineapple, rambutan, starfruit, and watermelon – are in abundant supply, as are vegetarian restaurants. It’s always best to drink bottled water and juices in Cambodia, while the beverage to indulge in is coffee. Light, comfortable, easy to launder clothing in natural fabrics such as cotton, suits Cambodia well. Good walking shoes and sandals that can be easily slipped off are recommended, as shoes are removed when entering temples and homes. No need to over pack, as high-quality clothes are strikingly cheap, while inexpensive laundry service is generally available wherever you go. Teachers should adhere to the local culture and ideas of professionalism. \”Casually smart\” attire means that women should cover their shoulders (sleeveless shirts are acceptable, but very thin straps or tank tops are not). No low-cut necklines or very short skirts. Bare midriffs must not be visible, even when lifting arms up. Open-toed shoes are acceptable. Men should wear long pants (not jeans), short- or long-sleeved shirts with a collar (possibly with a tie), and loafers or dress shoes. Sandals and tennis shoes are not acceptable when teaching. Long hair should be neatly tied into a ponytail. Excursions are not just a leisure activity – they are an integral part of developing a true understanding of the character and beauty of your host country and its surrounding area. We balance the intensive classroom work and practice teaching with a series of excursions that occur throughout your training and your time in Cambodia. You are welcome to sign up in-country to make the most out of this experience! The program starts with an initial welcome tour of Phnom Penh during your arrival weekend. You will have the option to join fellow participants for a 3-day excursion to Angkor Wat following the first week of the program. This has been our most popular excursion by far, and includes three glorious days wandering through ruins of the largest religious building area in the world. Temples range in condition from moderately restored to jungle encrusted. The excursion includes time for a visit to a near-by waterfall to cool off, relax and enjoy. This trip creates memories that will be treasured forever! A second optional excursion is a weekend on the beautiful beaches of Sihanoukville in Cambodia. Here you will have a chance to relax, swim, and enjoy some good food with your fellow teachers. Phnom Penh itself is home to a large and rising number of venues catering to a mixed crowd of expatriates, tourists, and locals — old and young alike. The quality of pubs and bars in Phnom Penh varies widely, from cheap and cheerful backpacker bars to sophisticated nightclubs. Explore the tragic history of the Pol Pot years with visits to the Tuol Sleng Museum and the Killing Fields of Choeung Ek. Bordered by Thailand, Laos, and Vietnam – and with a coastline on the tropical Gulf of Thailand – Cambodia is at the heart of Southeast Asia. Border crossings are now easily negotiable for travelers wishing to explore further afield.